Autumn is my favorite time of the year and it’s one of the reasons I can handle the Wisconsin winters. There really is nothing quite like the changing of the leaves and the activities that fill our Fall schedule. The bonfires, apples, pumpkin flavored everything – I can’t wait! It’s also a big time for date days or nights for us as our Summer is so jam-packed that we usually forget to take time for just the two of us. 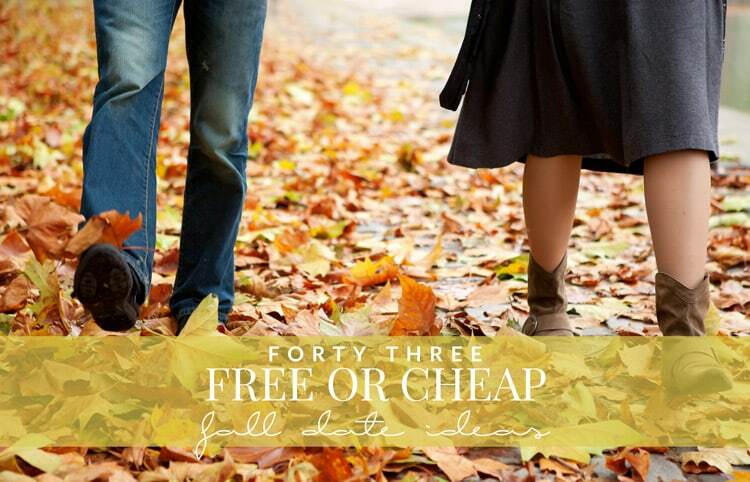 So today, I have 43 free or cheap fall date ideas that you can easily do! I am excited tor the festivals and halloween with the kids. I’m most excited to visit pumpkin patches and apple picking farms with my grandsons! I am most excited to go apple picking with my family this fall. I’m excited to carve pumpkins with my kids for the first time! I am excited about the cooler weather and the leaves changing and being able to spend more time taking walks with my dog. I’m excited for it to cool down…it’s 104 right now. Can’t wait for apple cider donuts! I am so excited for all things pumpkin! From the pies to the candles I love pumpkin and if I could have it all year round I would. I am most excited about cooler weather. I’m most excited to do all my fall baking! I’m most excited to see the change of colors outside. The food and drink of the season. Fall is my favorite season, I love the cooler temperatures. the fall scents and colors!! I am most excited for cooler weather and falling leaves. 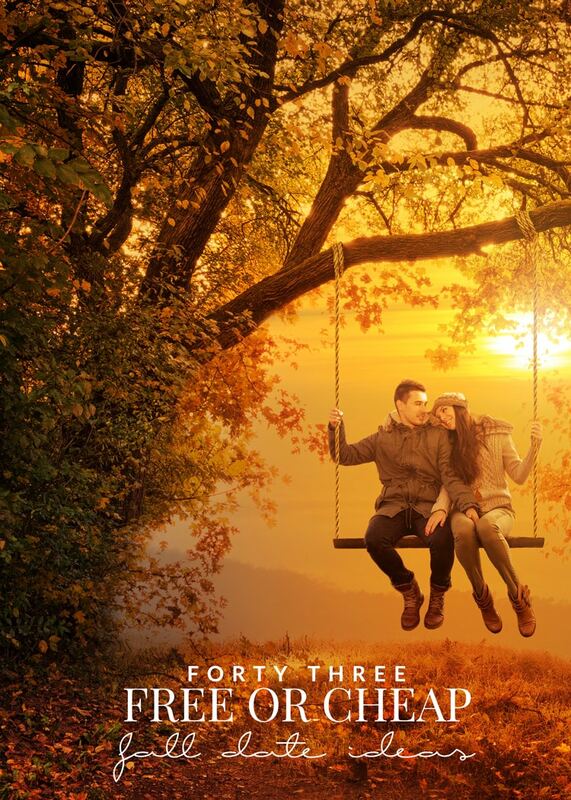 I’m excited to see the beautiful scenery of fall when leaves turn red and brown. I like the Cooler weather. It has been so hot this summer. I also love the trees when they change colors! I really want to read ghost stories with Iz this year – a few years ago I bought him the Scary Stories to Tell in the Dark box set with the original art but we never read them! I’m excited about running outside more often and going to visit the mountains to see fall foliage. I’m excited about cooler weather and the leaves changing. What I love most about fall is the the colors! Love the leaves changing colors! So beautiful! I like the cooler weather and lower electric bills. I am excited to wear my jeans and boots! I am excited for the cooler weather, and getting back into a homeschool routine with the kids. I’m looking forward to cooler weather and all the fun things that come with it. I am excited about PUMPKIN EVERYTHING LOLOL! I’m most excited about the trees turning colors. What I love about the autumnal season is the fact that my grandma is coming to visit my family and she’s staying with us for a while!! I am looking forward to the cooler weather. I’m excited about our upcoming road trip to New England for leaf peeping! The crisp fall air to be able to walk and enjoy myself in. Excited for all the fall fashions, the changing of the leaves and warm foods! I am excited for fires,roasting marshmallows and beautiful colors all around. Crisp air and warmer clothing, being more comfortable and pumpkin everything!!!!! I am excited for the pretty colors and lots of pumpkin. I am looking forward to the cooler weather and visiting the pumpkin patch with my kids! The perfect weather. Not too hot, not too cold. The beautiful Fall colors. Hot Cocoa and hoodies. Aaah, I just love Fall! I can’t wait for the leaves to change color and the air to become crisp again! I’m most excited about my son coming home and the colors. I’m excited about fall fashion, baking more, and the fall weather. I wish I can start wearing sweaters right now… It’s 90 degrees out but the majority of my wardrobe is cute sweaters! For the first time in a very long time, I will be hosting Thanksgiving dinner! I’m really looking forward to that! I’m really looking forward to going to the apple orchard and seeing the leaves change color this fall. I’m most excited about everything! The crisp air, changing leaves, hot drinks, scarves and knee high socks, windy weather… Fall is my favorite! I’m really excited to be able to enjoy the outdoors this fall. It’s way too hot here in the summer, so we get stuck inside a lot! I can’t wait to have picnics! I am most excited for the change in the weather! Having comfortable days, and cool nights! T-shirts, sweaters, lounge pants, etc. Halloween, it’s my favorite holiday! I like to take photos in the forest preserves of the nice and vivid color of the trees in the fall.